by Alec Clayton – Gay rights activist Selena Winters is shot in the head while giving a speech at the Seattle Pride celebration. She is rushed to the hospital where a blood clot is removed from her brain. She slips into a coma. Selena’s husband, Marty, and family members gather to wait and see if she will ever regain consciousness. …until their son tells them he is gay and until Marty’s old friend Chuck, an embittered Vietnam vet, comes back into his life, until they run into trouble with a neo-Nazi group known as The Nation, and finally until Maria returns. “There was always the chance, however slim, that some nutcase in the crowd would pull out a gun and blast somebody away. Marty and Chloe knew it, so they kept their eyes peeled. They might have felt a little silly about being so cautious; after all, nobody’d ever shot a Pride Day speaker, but they weren’t taking any chances.” – from the opening paragraph of The Wives of Marty Winters. 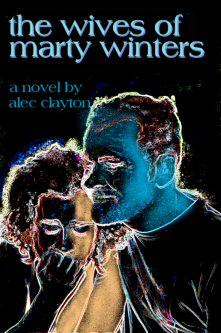 Order The Wives of Marty Winters from your favorite bookstore or Amazon.com.